A downturn in the economy coupled with a new baby caused bank manager Yevgenia Lazareva to take a chance on a new career. Yevgenia Lazareva was a successful top manager at a major Russian bank. But the 2008 crisis and the birth of her son made her rethink her career. Rejecting the rigid rules of corporate life, Lazareva decided to put family first. This was the beginning of the Mamanonstop clothing brand. Lazareva never planned to become an entrepreneur. A graduate of the Institute of Economics and Finance at the Moscow State University of Railway Engineering, she found a lot of success in the financial sector. In her last position at a major Russian bank, she was the Director of Asset Management overseeing 200 employees. Lazareva was focused on banking career. But then 2008 came. "Instead of further developing the business, I worked on anti-crisis management. I had to lay people off. And all this coincided with my pregnancy," she said. At the same time she broke up with her boyfriend and found herself alone with her newborn son, Fyodor. "Earlier I lived according to strict rules. Now I had to do something for my soul," Lazareva said. At the end of 2009, Lazareva put Fyodor in his coat to go for a walk in the park. She realized that she liked the baby’s coat so much she wished she had one for herself, and so she went to talk to a friend, designer Oksana Kosatkina. Kosatkina was happy to make Lazareva a coat like her son’s. Lazareva’s idea to dress in a similar style to her son is part of a larger trend in Russia today, according to Anton Korobkov-Zemlyansky, a member of the Public Chamber of Commerce of Russia. "Today couples stress that they are not only a family through wedding rings, but because they resemble each other in the style of clothing. It is not necessary to dress in exactly the same way. My wife and I, for example, wear similar accessories --- scarves, shawls, hats," he said. Customers like the idea of family clothing, says the manager of Milky-style, an online boutique that sells exclusive underwear for pregnant women. According to the manager, the boutique recently bought a few sets of matching pajamas for babies and mothers in the same style from suppliers as a test. They immediately flew off the shelves. Some maintain that matching clothes for the family are not for everyone. Said an employee at a Moscow branch of the British children’s retailer Mothercare "We, as a major retail chain, are unlikely to sell such clothes. Our customer is not ready for this," she said. Mamanonstop customers don’t necessarily disagree. They do, indeed, want something unique. "Many children in Moscow wear Mothercare clothing. But if you want to put yourself and your baby in comfortable, original and inexpensive clothing made ​​of natural fabrics, it is best to choose a brand like Mamanonstop" said Marina Totskaya. Lazareva released Mamanonstop’s first collection of dresses and pajamas in the spring of 2010. Costs of materials, patterns, and work at Kosatkinaya's studio totaled 20,000 rubles ($624). "I did not have a fixed amount of start-up capital. It was simply from my savings. I invested this money in my business" said Lazareva. She sold the collection through social networks, mainly to friends, and earned 40,000 rubles ($1,248). The second batch of clothing was made-to-order by customers via social networks. A real boom came in early 2011 when she and Kosatkinaya released knitted caps for children. " didn't expect such success," recalls Lazaerva. By mid-summer all 1,000 sewn hats were sold, 500 of them via Twitter. Then Lazareva understood that it was time to start mass production. In Spring 2011, she rented a workshop from friends for 6,000 rubles per month ($200); she spent 100,000 rubles ($3,100) on supplies and sewing machines, and hired seamstresses on a temporary basis as well as a few more administrative staff. According to Lazareva, the project very quickly became self-sustaining. "These projects, without any capital expenditures and retail sales organization, often become self-sufficient in a couple of months and begin to make a profit," said Alexander Brechalov, vice president of an organization that supports small- and medium-sized businesses. In October 2011 Mamanonstop began offering another product in its lineup: orthopedic pillows for pregnant women filled with small beans. "This is our exclusive product. No one else in Russia produces such pillows," said Lazareva. Lazareva’s business is not without problems. First off, producing clothing in Russia is expensive. "It would be cheaper to have them sewn in China or Vietnam. But I do not have such a huge business to place orders at foreign factories," Lazareva said. In order to hire a sewing factory in China, it is necessary to order a size range for 1,000 models, and Mamanonstop produces a size range for only seven or eight models. Additionally, establishing production in China would require engaging a partner who would monitor it there. Another problem is access to retail shopping centers. Last winter Mamanonstop took part in the Christmas Market at Afimall. Renting 1 square meter of space cost 90,000 rubles ($300), and there were no sales. Lazareva still sells her products through social networks. She also has friends work on commission selling the goods. The company also has an online shop and sells on third-party websites. The brand has gradually started to gradually appear in the regions. She has buyers in Ulyanovsk, Izhevsk, and Krasnodar. Lazareva plans to franchise in order to further promote her products in the regions. In February 2012, Mamanonstop won an award for Best Startup in the Business Success 2011 contest. But when she saw the photo of her products accompanying the write-up in the press, she was suddenly disappointed. “There were an identical mama and daughter, like clones, dressed in white. I thought: 'Am I really making everyone the same through my clothing?'" But then she remembered that from the beginning she has wanted not so much to promote one style, but to promote family values through clothing. "Family values ​​have become the philosophy of my business," she said. Lazareva’s latest collection is called "Bedtime Stories." It is made up of pajama sets for the whole family with prints depicting Russian fairy tales and featuring big pockets just right for a book. Mamanonstop is also involved in various social projects, such as the Flower Bud [Buton] theater festival. Lazareva has also established a partnership with Bumper, a bus-based children's bookstore, where books are sold alongside pajamas, promoting family reading. 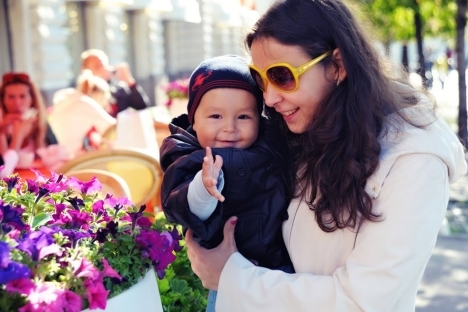 In addition, Lazareva is trying to create a community of new parents around its brand. A strategic investor is needed in order to raise the company to the next level. "Before, I was against partners, but now I see that it is necessary for further development," said Lazareva, adding: "I began this business for reasons of the soul, then became involved with business processes, and now I am trying to combine the soul approach with the business one. The main thing is to do all of this harmoniously."